As a 15-year-old girl in post-war Britain Dorothy Peters joined newly-formed Land Rover to work on the very first off-roaders to be built. She had joined the service department in 1946, at the firm’s factory, in Solihull, near Birmingham, as the original Series 1 Land Rover was being produced. The Land Rover had its world debut at the Amsterdam Motor Show in 1948 and one of those brand new 4X4s held a special place in Dorothy’s heart – the 16th off the line, which she was photographed with before they even went on sale. For seven decades she had that photograph, always wondering what it would have been like to have been driven in it. And then, aged 87, a chance encounter this year meant she was not only reunited with the very same off-roader that she worked on all those decades ago – but also fulfilled her life-long ambition of taking a spin in it. 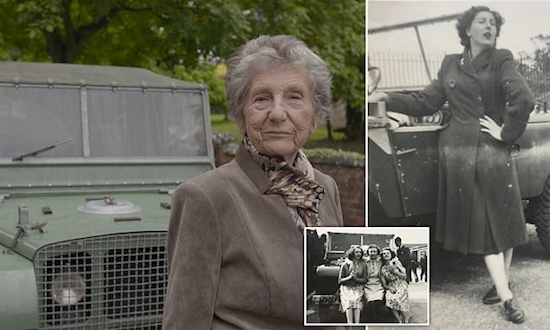 The road to an emotional reunion, which left her in tears, began in June this year, when Dorothy attended Land Rover’s 70th celebration festival event at the Lode Lane factory, in Solihull, the town in which she was born. She took with her a photograph album of her time working at the plant, which during the war had served as a secret and camouflaged ‘shadow factory’, to avoid being bombed by the Luftwaffe targeting industrial sites in nearby Birmingham and Coventry. Little did she suspect that particular black and white post war Britain picture would trigger events that would reunite her with her very special Series 1 Land Rover – number 16 off the production line. Mike Bishop, Land Rover Classic’s Reborn division engineering specialist and heritage expert spotted the fading photograph of Dorothy posing jauntily next to the very car he now owned – registration HNX 331. He decided to celebrate in a way he hoped she would never forget –including a drive around the factory’s testing off-road route called The Jungle Track. Over the course of the following weeks the Land Rover team at Solihull worked with Dorothy’s daughter and granddaughters to create a day full of surprises. Then they brought her back to Solihull and the car she posed next to 70 years earlier. As the classic Land Rover took Dorothy through mud, steep inclines, and water, she held her head in her hands excitedly and said: ’Am I dreaming? Oh my goodness, it is amazing this vehicle can cope. Reflecting on her time at the factory, for which she had her original identity card from July 1946, she said: ’Of course it was called Rover then. We’d not heard of Land Rover. The roof was so high that birds would lay eggs in nests in the rafter, she noted. Owner of Land Rover number 16, Mr Bishop said of their chance encounter: ‘I was approached by a very charming lady with some pictures of her time at Solihull. But I had no idea we would share a special connection to number 16. Land Rover captured the emotional reunion on film and Dorothy and her friends were given a preview in a special screening at Dorothy’s retirement home.